Kathy Mock and her husband Aaron had always been biking enthusiasts but it wasn’t until their young son first took to the trails as a toddler that they started to view the sport as an integral component of not only their family life but also a social outlet. In today’s fast-paced world of electronic games, cell phones, and competition sports, just being able to bike with friends often seems to be a thing of the past. However, Kathy recognized the importance of such outings and was inspired to create a biking club for children who maybe didn’t fit into classic sports, who sought companionship with other like-minded kids, and who also enjoyed the great outdoors. Fueled by the inspiration of her son’s love for biking and the widespread affinity for the sport that was being widely exhibited by his peers, Kathy set out to form a mountain bike club that catered to the local youth. The Wisconsin Interscholastic Cycling Association (WIN) was founded in 2013. “The club just grew like crazy,” Kathy said. The small informal group quickly burgeoned to 85 students and the interest in the sport only continued to escalate. Parent involvement also flourished. Within a couple of years, the bike club joined the National Interscholastic Cycling Association (NICA). Kathy and Don Edberg are Wisconsin’s NICA Founding Chairs. NICA fosters biking programs in schools across the nation. Currently, 12 states feature the program in their schools and over 4,500 students compete. The season kicks off every July and runs through October. Biking practice consists of meeting two or three times per week for training rides that vary in distance. The league typically has four to five NICA sanctioned races per year. One of the phenomena that Kathy has noticed about the sport of biking is that kids who participate in the school activity also usually meet even more often then required to enjoy the sport with their friends. It is not uncommon for a group of youth to head out in the afternoon or weekends to pedal the Elroy-Sparta Trail just for the sheer joy of the ride. Kathy remains deeply moved by the interest her small biking club spurred in children and how it has grown. Local state youth participation in the biking program increased by a dramatic 40 percent in 2016 and is forecast to climb substantially in 2017. In Wisconsin, the sport remains a low-pressure activity that anyone of any skill level can participate in, just as Kathy first envisioned when she created her small biking club. A student doesn’t have to be a star athlete to join. The focus remains geared towards social enrichment, fun, and the great outdoors. Kids who often didn’t feel comfortable participating in or even trying out for conventional school sports found a niche with mountain biking. If a child doesn’t feel like pushing himself to the limits but still wants to join in the fun then he is more than welcome to pedal at his own pace without any pressure to win, unlike other school sports. Everyone’s a winner in the sport of mountain biking because it’s ultimately boils down to the rider and his bike. One of the biggest things that Kathy loves about mountain biking is that it remains genderless. Girls compete alongside boys and excel just like their male counterparts. Biking isn’t about physical size or prowess. The playing field is leveled when it comes to mountain biking and girls are just as skilled at the sport as the boys. This helps fuel a lifetime of female confidence in young girls that is rarely achieved with other school sports. The races are about more than just completing the day’s trail ride.They are about friends and family. Families often camp for the weekend at the race locations. There is always an abundance of food and fun for everyone involved. 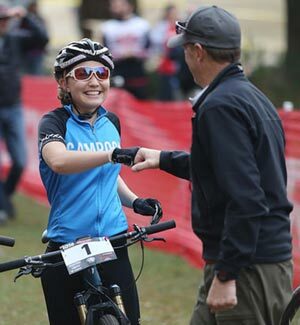 Unlike other school sports that rely on a school funding and a professional coach, what makes mountain biking programs triumphal is the participants and their families. The program’s success cannot happen without volunteers who love the sport and are willing to be active members. From a small group of enthusiastic kids who loved to hit the trails on their bikes to a flourishing middle and high school sport with thousands of participants, Kathy’s dreams continue to be fulfilled. All she has to do is look at the smiling faces of the kids as they ride to continue to feel inspired. 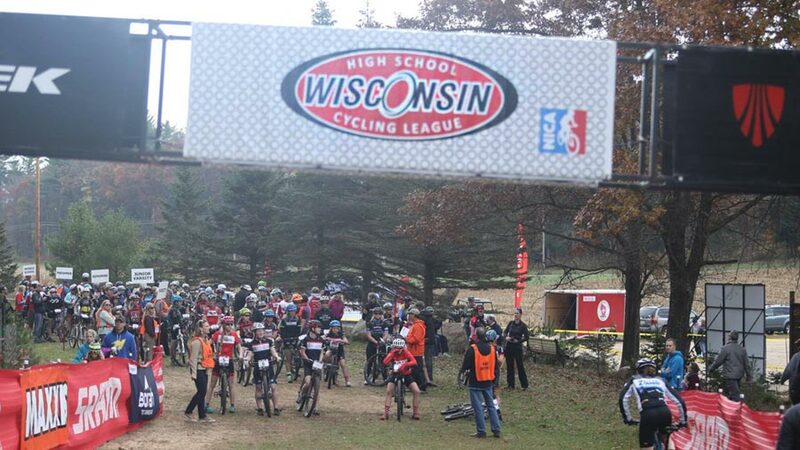 Visit the website for the Wisconsin High School Cycling League. Photographs for this article were used with permission from Kathy Mock. The photographer is Dave Reich. You can see more of Dave’s photos here.